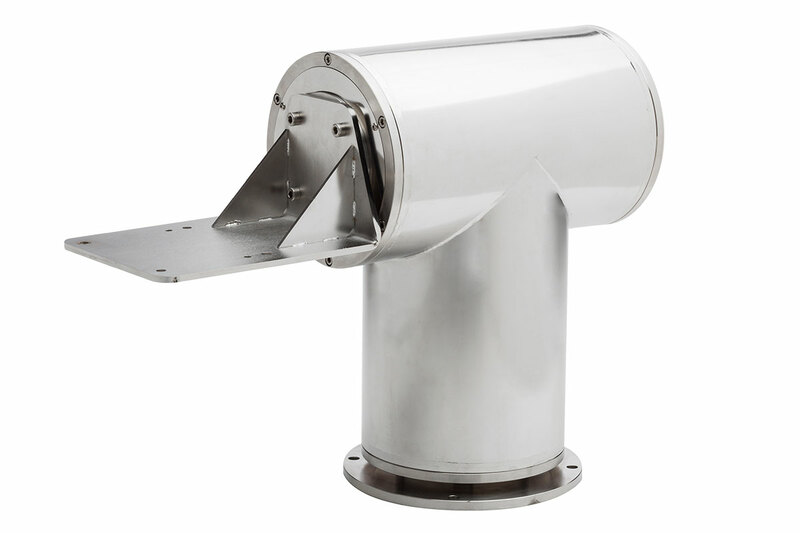 The VSPT250HD is an Heavy Duty Pan & Tilt unit designed to be used in coastal and long range surveillance, vessels and any industrial application which require the motion of PTZ cameras with large zoom lenses or other heavy loads. AISI316L stainless steel unit construction guarantees high performance even in the harshest and most corrosive environments. The built-in telemetry receiver RX250DC (optional) controls the electronic end stop limits. Pre-set positioning is controlled by precise potentiometers fitted as standard on both pan and tilt axis. The VSPT250HD Heavy Duty Pan & Tilt unit uses rugged high torque DC voltage motors that permit smooth and precise movements along with variable speed control, necessary when using big zoom lenses (such as Raymax "cats 2000", Myutron PH33X16HS-RGE, Fujinon C22 and D60 series, Pentax H20ZAME and H55ZAME series, Kowa LMZ1000AM, Tokina TM55Z1038 series), therefore the VSPT250HD is the perfect companion for both the 204 and 254 Series camera housings. The unit need very low maintenance, due to the high quality materials used and accurate design of the components.